The HBP Education Programme is collecting information on lab visits offered by HBP partners. A list of contacts can be found below. Please note that applications have to be sent directly to the respective lab. 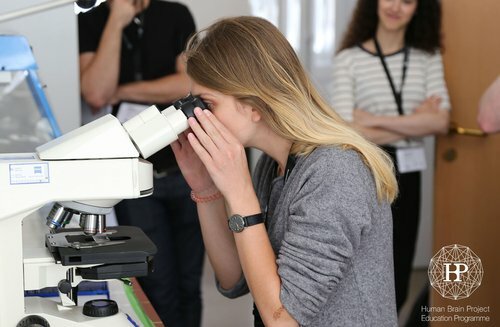 If you are interested in offering lab visits, please fill out the HBP Lab Visit opportunities form and send it to education@humanbrainproject.eu. Hands-on activities related to the HBP Brain Simulation Platform and cellular level model of the hippocampus. Applications will be evaluated as soon as they are received. The decision will be based on the information provided by the student, the requested period for the visit, and the number of concurrent visits, which cannot be more than 5 at any time. Techniques to record neuronal data from single neurons and population of neurons are rapidly improving. Meanwhile, recordings are possible from hundreds of channels simultaneously while animals perform complex tasks. Thus also the analysis of such data becomes increasingly challenging. In addition, progress in simulation technology and computer hardware enable the simulation of full-scale models to interpret such data. The lab visit aims at providing deeper insights in state-of-the-art analysis or simulation approaches. The course is addressed to excellent master and PhD students and young researchers who are interested in learning advanced techniques in data analytics and simulation and in getting hands-on experience in computational neuroscience. Experienced researchers will help the visitor to learn how to operate one of two complex software packages of the HBP efficiently and safely. Participants will analyse provided data on their own using the tool box Elephant or will learn how to carry out neuronal network simulation with NEST. Neuronal network simulations with NEST. NEST is a simulator for spiking neural network models that focuses on the dynamics, size and structure of neural systems rather than on the exact morphology of individual neurons. The student can also learn to extend the simulator according to need. Analysis of electrophysiological data with Elephant. Elephant is an open-source Python library that provides tools for the analysis of neuronal activity data, such as spike trains, local field potentials and intracellular data. Elephant focuses on generic tools that characterize the coordinated dynamics of large neural populations and methods that analyse the relationship of data recorded on multiple scales of observation. The student can also learn to extend the toolbox to need. Applications are reviewed every 2 months and participants are selected according to qualification and success likelihood. The goal of the INM-7 is to obtain a more detailed characterisation of the organisation of the human brain and its inter-individual variability in order to better understand its changes in advanced age as well as neurological and psychiatric disorders. Based on this knowledge, new approaches for diagnosis and outcome prediction at the level of individual patients are developed. We pursue this objective by combining multi-modal MR imaging, detailed neuropsychological characterisation and innovative methods of data analysis and simulation. An important focus of the institute is to provide the developed tools and results to the scientific public in the form of software and data sets enabling the broad use of our research. Costs to be covered by participants Travel costs, accommodation, daily expenses, transportation, insurance, etc. Applications will be evaluated w.r.t. skills level of the student and suitability of desired activities within the lab's research plan. Writer of recommendation letter will be contacted. Upon positive initial evaluation, students will be invited for a skype interview to further assess fluency in English, interests and motivation, and skills. For long stays, the administrative application may take 2 to 3 months. At Middlesex, we develop simulated and emulated neural agents. We are happy to support you in developing your own agents. Costs covered by lab Middlesex will provide researchers research material, access to HBP resources, and office space. Hands-on activities related to the HBP Neurorobotics Platform and spiking closed loop motor control of robots. Applications will be evaluated as soon as they are received. The decision will be based on the information provided by the student, the requested period for the visit, and the number of other applicants. The students will be introduced to the concept of large-scale brain modelling in healthy and clinical populations. According to their expertise and preferences, the students will learn how to process and analyse data, or how to model neural populations, or to perform analyses on real and modelled data. Applications will be evaluated by the supervisor and assigned on a first come, first served basis to compatible candidates. Applications will be evaluated as soon as they are received. The decision will be based on information provided by the student, the lab's research plan, and the number of other applicants. Administrative prearrangements prior to visit may take 2 months.